Summary Knitting A - It's an informal friendly group who"Knit and natter" but much more. Venue We meet the third Tuesday of the month at 2:00pm, in the home of members of the group. We are an informal friendly group who “knit and natter” in each other’s homes, on the third Tuesday of the month at 2p.m. There are currently seven members with room for another. Although we are all female, men would be welcome. Patterns and ideas are exchanged and help given. Members knit for themselves and make articles such as poppies and Christmas gifts sold for various charities and given to local hospitals. Knitting Group ‘A’ meets on the third Tuesday of every month to knit and natter in each other’s homes. At present we have 8 members. 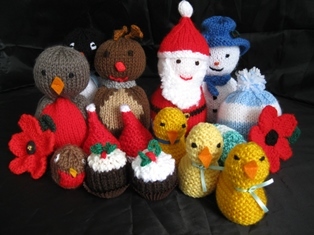 During this year as well as making personal items we have knitted for various charities. •	Poppies were made and sold for The British Legion. •	Small items for Easter and Christmas raised funds for St Anne’s Hospice. •	Some donated wool made clothing for Wellspring and Christmas boxes for “Christmas Child”. •	St Mary’s Hospital and Stepping Hill also received tiny hats for premature babies. •	“Rainbow Dolls” were sold for Francis House. •	Twiddle Mitts and “Forget-me-nots” have helped dementia patients. •	We also contributed to the U.R.C. Christmas Yarn Bombing around Bramhall.